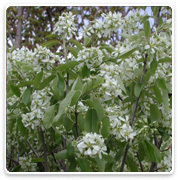 Regent Saskatoon Regent Saskatoon Serviceberry, amelanchier alnifolia 'Regent', is a multi-stemmed shrub that displays multitudes of white flowers in spring and produces small black-purple fruits that are sweet; excellent for fresh eating or making jelly. Birds love them too. Since it flowers early in spring, this plant provides food for many pollinating insects. The gray-green foliage turns yellow to red in fall and is attractive to bees, butterflies and/or birds. 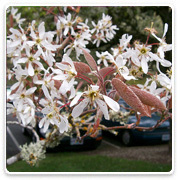 The Autumn Brilliance™ Serviceberry, Amelanchier x grandiflora 'Autumn Brilliance', is a rounded, graceful, smaller tree whose stems will be covered in white blossoms each spring and sweet purplish-black fruit each fall. Its spectacular show of white flowers in early spring is one of its main ornamental features. They begin to flower as a pale pink then fade to snowy white fragrant flowers. Deciduous shrub reaching up to 24" tall and about 30" wide. Branches are slender, spiny, and small. Leaves are roundly oval in a deep red to purple color. Small, yellow flowers borne beneath leaves, from April to May, not showy. Bright red berries can be found along stems from late fall through winter. Ironically, this is never really considered a feature of this plant. 'Crimson Pygmy' is the most popular Japanese Barberry. Best located in full sun, this plant is tolerant of many types of soil, but will not do well in wet to very moist soils. As name Barberry implies, this makes an excellent hedge or filler shrub. Outstanding living column with vivid purple foliage is a designer's dream. This barberry offers three seasons of interest with yellow spring flowers, red fruits and intense fall color. Adds instant drama as a focal point or repetitive structural element in beds and borders. Deciduous shrub. Full sun for best color. Moderate growth to 6 feet tall, 1 to 2 feet wide. Barberry Sunjoy Gold Pillar, Berberis thunbergii 'Sunjoy™ Gold Pillar', is another outstanding Proven Winners® Color Choice® shrub that is a must have for every landscape. 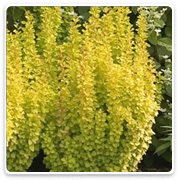 'Sunjoy™ Gold Pillar' is similar in shape to 'Helmond Pillar', but with bright golden foliage and red new growth. The 3-4' pillars of gold provide great garden architecture and look stunning in autumn as the foliage turns a blazing orange-red. The Barberry 'Rosy Glow', 'Berberis thunbergii', is an easy to grow shrub that is great for beginner gardeners. 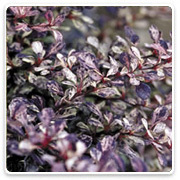 This barberry is a vigorous cultivar and is a showy garden plant with its variegated leaves of purple with light pink splotches. With a plant height of 3' and a spread of 2-3', it should be planted in full sun to part shade. Full sun will produce the best foliage color. 'Rosy Glow' needs a well drained area and can tolerate some drought. Yellow flowers will appear in April and they may last until May. Use 'Rosy Glow' as a back of the border plant with Daylily 'Stella De Oro' or Rudbeckia 'Goldstrum'. The FINE LINE© Buckthorn, 'Rhamnus frangula ‘Ron Williams’ (PP14,791) , is a great new landscape plant. FINE LINE® combines the feathery foliage of ‘Aspenifolia’ with the narrow upright habit of ‘Columnaris.’ Use FINE LINE® in narrow hedgerows for privacy, as an accent plant, or even in a patio container. 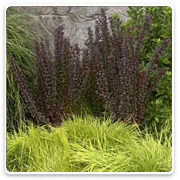 It’s a great vertical accent for the perennial garden, and the narrow habit is perfect for framing entrances. This is an extremely useful, architectural plant for the home or commercial landscape. This cultivar produces very few fruit, none of which have been shown to be viable. The Dwarf Burning Bush can eventually grow to 3 meters (10 feet) high if unpruned, but is easily kept at 1.2 meters (4 feet). Leaves turn scarlet red in fall. Grow in full sun for best foliage color. Prune in early spring to keep shrubs bushy. Cut back by at least 1/3 and remove any damaged branches. Mulch and water during dry spells. Can be sheared and shaped into a formal hedge. Autumn Magic Black Chokeberry, Aronia melanocarpa 'Autumn Magic', has fragrant white flowers in May, followed by large, edible, dark purple-black berries, that persist throughout the season. The berries are commonly used to make juice. The glossy dark green foliage has incredible red and purple fall colors. It can grow to six feet height and width. The Cotoneaster Cranberry, 'Cotoneaster apiculatus', is a deciduous shrub that is easily grown in average, medium wet, well-drained soils in full sun. It has a wide tolerance of soil types.The branches may root where they touch the ground. This dense shrub displays stiffly arching branches. The small pink flowers appear in late spring and they will produce red cranberry-like berries in late summer. The autumn leaf color is very attractive with shades of purple, red and bronze. 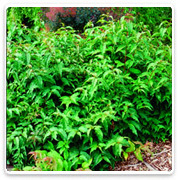 Use this plant to cover large areas, as a foundation plant, a low informal hedge or for erosion control on steep banks. The Cotoneaster Peking, Cotoneaster 'acutifolia', is an erect shrub with slender spreading branches. 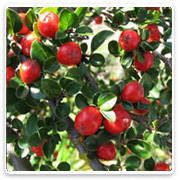 The Peking Cotoneaster is best used as a hedge, or in groupings. 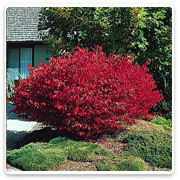 This shrub displays yellow to red fall foliage and performs best in moist, well-drained soils. This shrub does well in partial shade to full sun light. Cotoneaster may be appreciated more for its dark green foliage than its blossoms. The small flowers are white to pinkish. Three-eighths inch black berries ripen in September and persist through mid-winter and are appreciated by some song birds such as the Robin and Catbird. 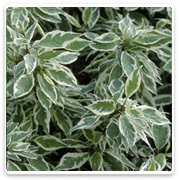 The Dogwood 'Ivory Halo', Cornus alba 'Bailhalo',also known as tatarian dogwood, is a cultivar that is noted for its compact size, variegated (white-edged) leaves and bright red twigs in winter. It is a rapid-growing, multi-stemmed, suckering, deciduous shrub that grows to a maximum size of 4-6' tall on erect, usually unbranched stems. 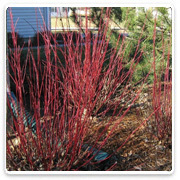 The outstanding ornamental features of this cultivar are: (1) bright red winter stems which are particularly showy against a snowy backdrop and (2) medium/dark green leaves (to 4.5" long) which are edged with white. Alleman's Compact Dogwood, Cornus sericea 'Alleman's Compact', is a four season beauty with white blossoms in May, pleasant green foliage in summer, giving way to bright red berries in fall, and finally an outstanding red twig color for winter. This dogwood is a suckering, colonizing deciduous shrub that grows 4' to 8' tall, and just about as wide. 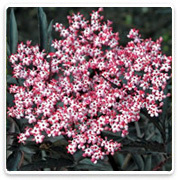 The Elderberry Black Lace, 'Sambucus nigra ‘'Eva' PPAF 15,575, is an award winning shrub, resembling the Japanese Maple. Adaptable to most soils, lime being one, it has a plant height of 3-6'. 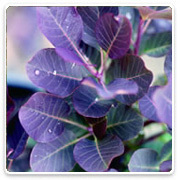 The dark purple, finely cut foliage looks great all year long. 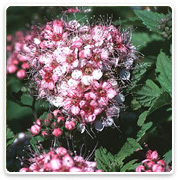 Flowering appears in June, and the attractive pink blooms contrasts well against its foliage. The Black Lace is extremely easy to grow and a very popular plant for the landscape. The uses for this plant are endless. Grow it as a shrub, as a bold perennial or train it into a small tree. 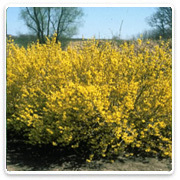 The Forsythia 'Sunrise', Forsythia x 'Sunrise', also known as Border Forsythia and Golden Bell, is a deciduous shrub noted for its colorful yellow spring flowers appearing before the foliage. All it requires is a sunny area and well-drained soil. It's also a very easy plant to grow and transplants well. This plant is good in container plantings, the border plantings, and as a specimen or ground cover. Prune after flowering to keep the plant compact and to thin it out. 'Sunrises' display a purple fall leaf color. Dwarf Bush Honeysuckle, 'Diervilla lonicera', is a vigorous, spreading plant that exhibits an abundance of small, tube shaped, yellow flowers in late spring to early summer. 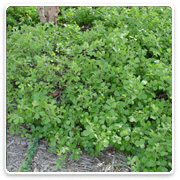 This low mounding shrub is great for drier sites and well-drained areas in partial shade. Dwarf Bush Honeysuckle makes nice mass plantings because of its short height and quick growth rate. The red, orange, and yellow colors of the bronze tinted foliage becomes bright and very welcome in the fall. 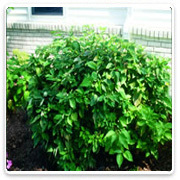 This shrub is excellent for bank plantings because its roots will help retain the soil. It is attractive to bees, butterflies and/or birds. 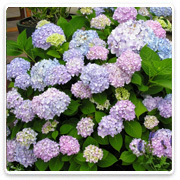 A distinct cultivar of Hydrangea plant named ‘Big Daddy’, characterized by its large and vigorous growth habit; upright and rounded plant habit; large glossy dark green-colored leaves; and large inflorescences with large pink-colored flowers. The rocketing popularity of 'Endless Summer' results from the fact that, unlike most hydrangeas, this one has the ability to bloom as far north as Minnesota (maybe much further). In the south, where hydrangeas rarely bloom more than once per summer, 'Endless Summer' will often produce a full set of blooms twice each summer. Lemon Daddy has polished vigor and quickly reaches four feet high by four feet wide, making a lovely accent plant for that special spot in the garden. Best of all, Lemon Daddy is easy to grow in the hot, humid summers of the Deep South and Midwest. Good soil is a must, but once established this hydrangea will prove to be a reliable performer with little need for special care. Lemon Daddy is the most robust yellow hydrangea to date with thick shiny leaves and is a great choice to lighten up a dark area of the garden. The Hydrangea Lime Light, 'Hydrangea p. 'Limelight', a Proven Winners selection, is an extraordinary new Hydrangia with exceptonal bright lime green flowers. This plant will really add cplr to a late summer lanscape. Lime Light has excellent vigor and is a floriferous bloomer. This plant can also be utilized in a container. The Oakleaf Hydrangea, Hydrangea quercifolia, is an upright, deciduous shrub with a broad, rounded habit that typically grows 4-6' tall. It features elongated white flowers which slowly turn pinkish purple with age. The most vigorous blooming of all the hydrangea's. The blooms often weigh down the branches. Long late spring to summer bloom period. Distinctive, deeply lobed, somewhat coarse, oak-like, deep green leaves (to 8" long) turn attractive shades of bronze, crimson or purple in autumn. 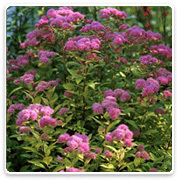 Delightful bright blossoms grace the tips of this a rugged, reliable plant. Valuable late season color over many months into fall with flowers that are at once red, pink and white. Considered the most cold hardy of this clan. Large upright habit makes good background or easily trained as a small tree. 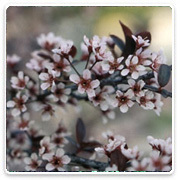 Cut blossoms are suitable for drying, or prune off in late winter or early spring. Thrives in moist, acidic well drained soils. Deciduous. Sun or part shade in dry climates. Moderate growth to 6 feet tall and as wide. 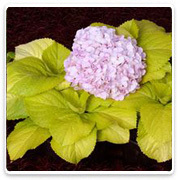 Hydrangea Pinky Winky™ is a unique Hydrangea with two-toned flower heads in mid-summer. The large, 12-16 inches long, flower heads emerge white, turn pink and continue to push new white flowers from the tip of the panicle. The two-toned effect is stunning! 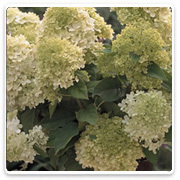 Hydrangea Pinky Winky™ flowers are held upright on strong stems and contrast nicely against dark green foliage. It blooms regardless of climate, soil, pH or pruning. A truly remarkable plant for the summer and autumn landscape. Hydrangea Quick Fire™ is a breeding breakthrough from the Netherlands. This spectacular new Hydrangea is adorned with rich deep pink blooms more than a month earlier than other varieties! 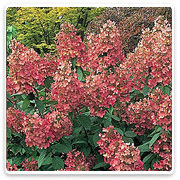 Plant Hydrangea Quick Fire™ in combination with other Hydrangeas for an extended season of color with these spectacular landscape plants. 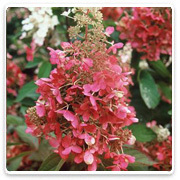 A Proven Winners® Color Choice® Flowering Shrub. Tardiva is a wonderfully dependable, airy paniculata. It can easily be trained into a tree form. The blooms look fresh on the shrub (or tree) for a long time. Even after they've faded, they look like white moths dancing around the tree. Some people are surprised that all the "buds" on the bloom do not open. This is natural to this plant. The blooms have only a few "open buds" (showy blossoms). The Twist-n-Shout, the latest release from the Endless Summer® Collection, is a hydrangea lovers dream come true. 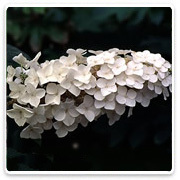 The first reblooming lacecap hydrangea can be in your garden next summer. 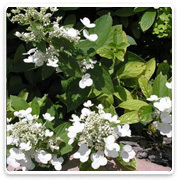 A true re-bloomer that is hardy to Zone 4 and heat tolerant to Zone 9 makes this adaptable hydrangea a natural choice for your garden or outdoor focal point. Lightly scented, pure white flowers shoot like fireworks in the early summer horizon. Its mounded, compact stature makes this a big improvement over older selections. Perfectly suited for flooding large banks, beds and borders. If burning bush has good fall color then this plant is a wildfire. 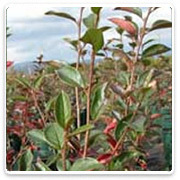 Little Henry® itea has fantastic blood red autumn foliage that is very persistant. Beauty of Moscow Lilac, Syringa vulgaris 'Krasavitsa Moskvy', is one of the finest lilacs with fragrant, double, delicate pale pink flowers. Blossoms are produced abundantly in early to mid-May on a vigorous upright plant. It is excellent as a cut flower and provides years of satisfaction. 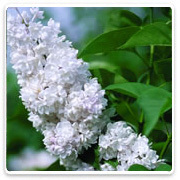 This lilac is easily grown in average, medium moist, well-drained soil in full sun. Beauty of Moscow tolerates light shade, but best bloom is in full sun. It prefers organically rich, moist, slightly acidic soils with good drainage. Best grown in cool summer climates, and not recommended for planting in the deep South. The Dwarf Korean Lilac - Tree Form, Syringa meyeri 'Palibin', is dwarf variety of lilac in tree form with single, very fragrant, pale lilac flowers and small clean foliage. This plant blooms profusely at an early age. This ornamental plant makes an excellent accent or specimen in the landscape. 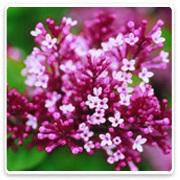 The Lilac' Miss Kim', Syringa patula 'Miss Kim', is a very popular shrub. 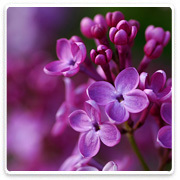 It is thought by many to be the number one Lilac in the Midwestern United States. 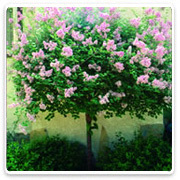 The Miss Kim Lilac is compact and upright-rounded in form. It has an abundance of fragrant blossoms in spring that are dark lavender-pink in bud and fade to a very soft lavender-pink when fully opened. The blossoms are even more plentiful when it is planted in full sun. Pocahontas Lilac, Syringa x hyacinthiflora 'Pocahontas', is a floriferous Lilac displaying deep maroon-purple buds that open into single, deep violet fragrant flowers in spring. It blooms before the French Hybrid Lilacs and has the true lilac scent. It begins to flower while still young in age. 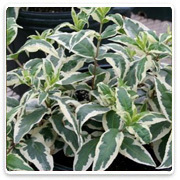 It is an extremely vigorous, hardy, upright plant with attractive dark green foliage. This plant is attractive to bees, butterflies and/or birds and requires average water needs; water regularly; do not overwater. Tinkerbelle® Lilac, Syringa 'Bailbelle' (PP12,294), is one of the Fairytale® Series and has an upright shape with incredible wine red flower buds. They open to single, bright pink blooms, with a spicy fragrance, in late spring. 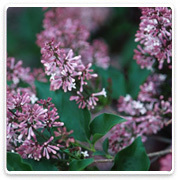 Tinkerbelle lilac is an excellent choice for foundation plantings or as a specimen. This lilac tolerates light shade, but best bloom quality and disease resistance occur in full sun. It prefers rich, moist, neutral soils. It should be pruned as needed immediately after flowering. The Ann Magnolia tree, Magnolia x Ann, is a member of the 'Little Girl' series of Magnolias that are the result of a cross originally made at the U.S. National Arboretum. 'Ann' develops a somewhat open habit with deep purple-red, 7-9 inch petaled flowers. 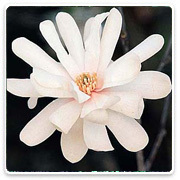 Ann Magnolia trees are vigorous and hardy. Best grown in normal garden soil in full sun. Large, fragrant, double white flowers appearing before the foliage. 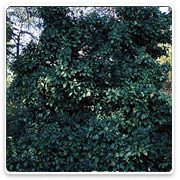 Upright, dense branching, multi-trunked large shrub or small tree. Blooms later than Magnolia stellata; useful in areas where late freezes occur. Deciduous. Full sun. Moderate grower to 10 to 15 feet tall, 10 to 12 feet wide. Cutting grown. A cool new purple ninebark hybrid that resulted from a cross between Physocarpus o. 'Nana' and Diabolo® This great new plant has attractive wine colored foliage and a dense, compact habit is about 1/2 the normal size. Use it next to yellow and bright green plants, or against a light background to get the best effect. Add color and vibrancy to any garden, especially in the spring when it blooms with white button-like blooms. The Purple Leaf Sandcherry, Prunus cistena, is a thick-growing, long-lived shrub that is sometimes called the Purple Leaf Sand Cherry. It produces bright red 3 inch leaves in spring and blushing, white flowers in May. In autumn it produces purple-black cherries and the foliage turns a magnificent reddish purple. 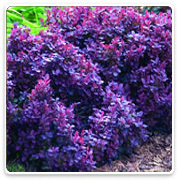 This ornamental shrub is especially valued for its hardiness and unique coloring. It is an asset to the landscape and a standout specimen shrub. This deciduous plant makes a wonderful hedge as well. Grows 7-8 feet tall, depending on pruning. Plant 2-3 feet apart for a hedge and best planted in full sun. Royal Purple Smokebush, cotinus coggygria 'Royal Purple', exhibits beautiful, velvety, dark purple foliage throughout the growing season, with panicles of smoky-purple to beige flowers blooming in mid-summer. This gives the effect of a cloud of smoke. 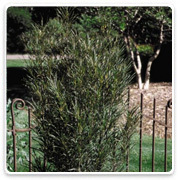 This xeriscape plant forms an upright, low branched, spreading shrub. It is a tough and tolerant shrub, requiring well-drained soil; and Royal Purple Smokebush thrives in part to full sun; the leaves are greener in shade, burgundy in full sun. With improved disease resistance, this bridal wreath shares the same arching displays of snow white flowers as its old time parent. Arching boughs blossom in mid to late spring that are stunning on cloudy days or in moonlight. Popular cut flower for wreath making. 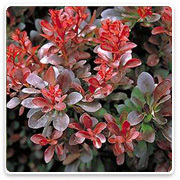 Fountain shape makes ideal specimen or dark green background shrub which turns orange-red in the fall. Tolerates wide range of soil conditions and is very cold hardy. Deciduous shrub. Full sun. Fast growth to 5 feet tall and 6 feet wide. The Spiraea ‘Little Princess’, Spiraea japonica, is easily grown in average, medium wet, well-drained soil in full sun to part shade. It tolerates a wide range of soils. Prune in late winter to early spring. 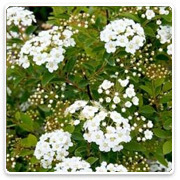 “Little Princess” Spiraea cultivar is a dense, upright, compact, mounded deciduous shrub which typically grows to 2-4' tall with a similar spread. Profuse pink flowers in small corymbs cover the arching stems of this plant in late spring. The Spiraea ‘Gold Flame’, Spiraea x bumalda, is easily grown in average, medium wet, well-drained soil in full sun to part shade. It tolerates a wide range of soils. Prune in late winter to early spring. Gold Flame Spiraea cultivar is a dense, upright, compact, mounded deciduous shrub which typically grows to 2-4' tall with a similar spread. 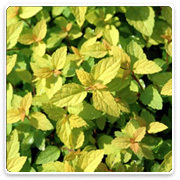 The Spirea 'Goldmound', Spiraea x 'Goldmound', this colorful plant provides an exceptional accent or contrast in your foundation planting or shrub border. 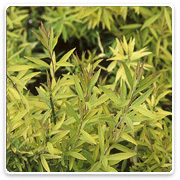 Brilliant foliage holds its light chartreuse-green color all season long. 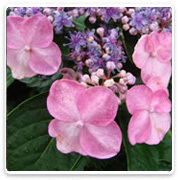 Flushes of pink flowers appear in June and July. 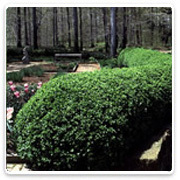 Dense bushy 18 to 24 inch plants maintain their nicely rounded, neat appearance with little or no pruning. The Spirea 'Magic Carpet', Spirea japonica 'Magic Carpet', is a colorful shrub that fits almost anywhere in the landscape. In spring the leaf shoots emerge vibrant red, maturing into rich bronze to light green red-tipped foliage. Clusters of deep pink flowers cover the plant in early summer. Spiraea thunbergii ‘Ogon’ - also sold as Mellow Yellow spirea - is a 5- to 6-foot tall deciduous shrub with thin, twiggy branches that grows into a gracefully mounded, multi-stemmed shrub. The slender, willow-like leaves are to 2 inches long. Neon Flash Spirea, spiraea japonica 'Neon Flash', is a 3 foot by 3 foot compact plant that is a fast grower with "flashy" bright red flower clusters blooming throughout the summer season. The dark green summer foliage emerges with a purplish tinge, and then in fall becomes a dark burgundy. 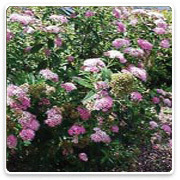 Spireas are among the easiest flowering shrubs to grow since they are tolerant of many soils except extremely wet. To 3’ tall at maturity. Hardy to zone 4. White, pink and red blooms all on one plant!!! Low, spreading graceful habit. Blooms summer into fall. Pest and disease resistant. Sem Ash Leaf Spirea, Sorbaria sorbifolia 'Sem' (16,336), is a pinkish-red, fern-like spring foliage that unfurls along deep pink stems . 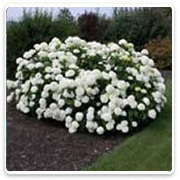 In July and August the neat, round shrub covers itself with creamy white blossoms. This dwarf variety makes a wonderful low hedge, or a great accent. Sem is an improvement from older Sorbaria varieties. Compact, better-branched, and more dense than others, it creates a tight, bushy little mound in the garden, making a fine low hedge or accent planting as well as a shrub border. 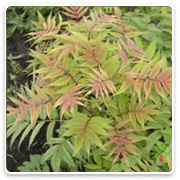 The Tiger Eyes® Sumac, Rhus typhina 'Bailtiger' (PP16,185), is a Bailey Nurseries introduction. 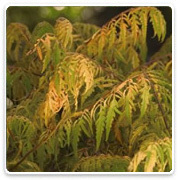 Tiger Eyes® is a beautiful golden-leafed form of Cutleaf Staghorn Sumac. New growth is a lively chartreuse green, quickly changing to yellow, both colors contrasting nicely with the rosy-pink leaf stems. The branches angle upward while the deeply cut leaflets drape downward, giving it a rather oriental look. As magnificent as the summer colors are, the dramatic effect of yellow, orange and intense scarlet in autumn are unparalleled. A selection of Fragrant Sumac grown for its very low, wide-spreading habit. Excellent glossy foliage. Beautiful red fall color. Great for mass planting and bank control. Xeriscape plant. The Summer Glow Tamarisk, Tamarix ramosissima 'Summer Glow', displays rosy flower spikes all summer and has an interesting foliage effect that is lacy, silvery blue. Fast growing, rather open shrub, it reaches height of 8-10'. Very tolerant of salt conditions - good for the seashore, and it is one of the finest and hardiest of all Tamarix varieties. Summer Glow is tolerant of most soils and grows in sun or shade. Formerly called T. pentandra 'Summer Glow.' To prevent dehydration and start buds to break on Tamarix, the freshly potted plants should be trimmed back one-third and started under greenhouse conditions, that is: warmth and high humidity. 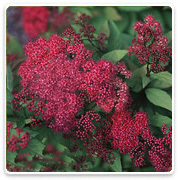 Viburnum Blue Muffin® is a new selection of Arrowwood Viburnum that is perfect for residential landscapes. 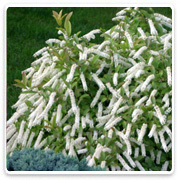 Clean white flowers make for a crisp contrast with the glossy green leaves in early to mid-summer. The flowers are followed by intense blue fruit in late summer and fall. Fruiting is enhanced when multiple plants are planted nearby. The fruit add interest to the fall landscape, and attract songbirds to the garden. 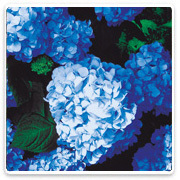 Viburnum Blue Muffin® is very durable and adapts well to a variety of soils. 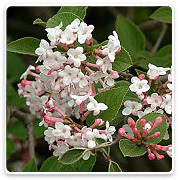 In early spring, Korean Spice Viburnum will be literally covered in deep pink buds that open slowly into clusters of white, waxy flowers. 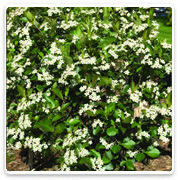 It is these flowers that emit the complex spicy, sweet fragrance that makes this shrub irresistible. One shrub is enough to perfume the entire neighborhood for weeks with the richest, most delightful fragrance imaginable. The white flowers are replaced in the summer by red fruit that will fade to a black-blue in the fall. The green foliage will turn to a bright red and then deep burgundy in autumn. 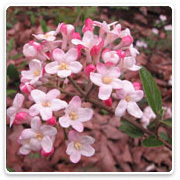 A rounded, spreading shrub with dark pink buds opening to semi-double, white flowers late spring. Reddish-black fruit appears mid-fall. Dark green foliage turns burgundy in fall. The Dark Horse Weigela, Weigela florida 'Dark Horse' PP14381, is a new cultivar that is characterized by a superior compact habit, dark purple leaves, and pink flowers that contrast with the dark foliage. 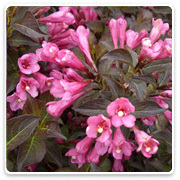 In combination, these traits set ‘Dark Horse’ apart from all other existing varieties of weigela. 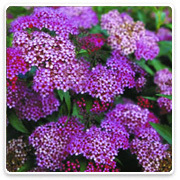 This is an ideal choice for late spring color in combination with conifers and broadleaf evergreens. Will attract hummingbirds! This old-fashioned, flowering deciduous shrub has very dark foliage and deep pink flowers that contrast well with the foliage. 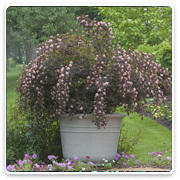 'Dark Horse' makes a great landscape plant, and it retains its color interest throughout the season. It is quite attractive when grown as a hedge. 'Dark Horse' is easy to grow, and adapts to most conditions. Feed once a year with a slow release fertilizer.